We all know how hard it is to find out a workout routine and it is actually tougher to stick to one. That is because an exercise program should be fun easy to use, convenient and most importantly it has to get you results. Bouncing on Urban Rebounder combines the non-impact cardio of an elliptical to break a sweat without irritating your joints, the elevation of a stair climber and the calorie burning intensity of a treadmill to increase your stamina and tone your entire body. A rebounder workout is a fun workout that will melt away the fat and build long lean muscles. Most importantly, it will leave you feeling healthy and strong because it is so easy and gentle on your body. 1 Is rebounding a good workout? 3 How is Urban Rebounder different from other mini trampolines? 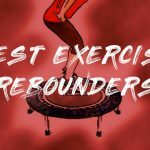 Is rebounding a good workout? 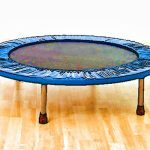 Rebounding or jumping on an exercise mini trampoline has immense health benefits. Most other exercises work only a few muscles but rebounding generates G-forces to rhythmically flex and relax every muscle working one hundred percent of your body. No other exercise can offer this much fun and be this easy on your joints. In fact, NASA scientists found that rebounding was up to sixty percent more effective than treadmills or other forms of exercise. 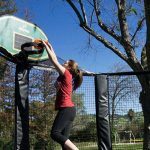 The secret to rebounding is a unique non-impact metabolic training. With typical cardio workouts as your intensity increases, so does the stress on your body. Your body needs to spend energy and time recovering from injury. This slows down your metabolic rate. With rebounding, you get a total body workout without the stress on your joints, so you can recover faster. This means that day after day your stamina increases along with your metabolism. Working out on a rebounder is not only fun but also it’s a lot easier on your joints than doing a workout on a an unforgiving hard surface. Each bounce triggers an active, passive and responsive force in both your muscular and neurological system. In the active stage at the start of each bounce, your muscles fire up propelling your own body weight as resistance. When you reach the top of the bounce, it is the passive stage where your body experiences true weightlessness allowing your muscles to relax completely sending endorphins to the muscle tissue. As you reach the bottom of the bounce, the third stage or the responsive stage is triggered. Your body drives down into the soft flexible mat where your stabilizer and core muscles are engaged as they react and gain balance. This cycle repeats every bounce giving you the unique workout ever created. How is Urban Rebounder different from other mini trampolines? 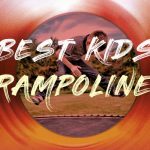 Most mini trampolines have a small aluminum frame that warp and bend under pressure. The Urban Rebounder has six to eight steel legs and high yield steel frame that creates a rock solid base. Urban Rebounder uses tapered jumbo springs that are attached to the frame using steel connector pins. 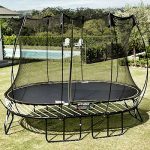 The springs in most cheaper mini trampolines are directly attached to the frame giving a jarring bounce, as they are not able to absorb the shock efficiently. The Urban Rebounder has a permatron mat surface that flexes to absorb the impact prolonging its durability. The lightweight Urban Rebounder also conveniently folds up in a quarter so you can take it anywhere you want. The Urban Rebounder can also be placed at a 22 degree angle to be used almost like a stepper or an elevated treadmill like you are hiking up a hill. 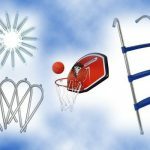 This rebounder is very easy to assemble, as you just need to unfold the frame and the legs held in place by springs. The springs and mat come preassembled. There is an option to install the stability bar if required. You can fold and store it under the bed. It may require two persons to fold it though. The weight limit for Urban Rebounder is 300 pounds. Each pair of springs is attached to the frame in a V-shape pattern. The jump surface area is around 28 inches. The base of each leg is covered with hard rubber to protect the floor. Some users complained about the strong plastic smell after opening the package. This could be due to the plastic bags covering the contents of the package or due to the rubber pads attached to the trampoline legs. It fades away after a few days. The package includes a DVD workout for beginners. The DVD also includes an elevated intense workout routine. If you use it for an elevated workout ensure to place the rebounder on a non-slippery surface. 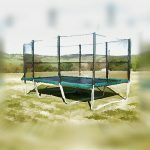 Users found the Urban Rebounder springs of good build quality compared to their previous trampoline purchases that required replacement springs within a year of purchase.